Self destructive writer Dan Harmon ("Community," "Monster House," "Heat Vision and Jack") claims he will one day found a colony of like-minded misfits. He's appointed suit-clad gadabout Jeff Davis ("Whose Line is it Anyway") as his Comptroller. 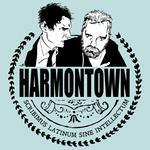 Harmontown welcomes the return of comptroller Jeff Davis, Mayor Harmon wants you off his lawn and creator of The IT Crowd, Graham Linehan, meets Dan on stage for the first time and they exchange their transcontinental show runner blues.